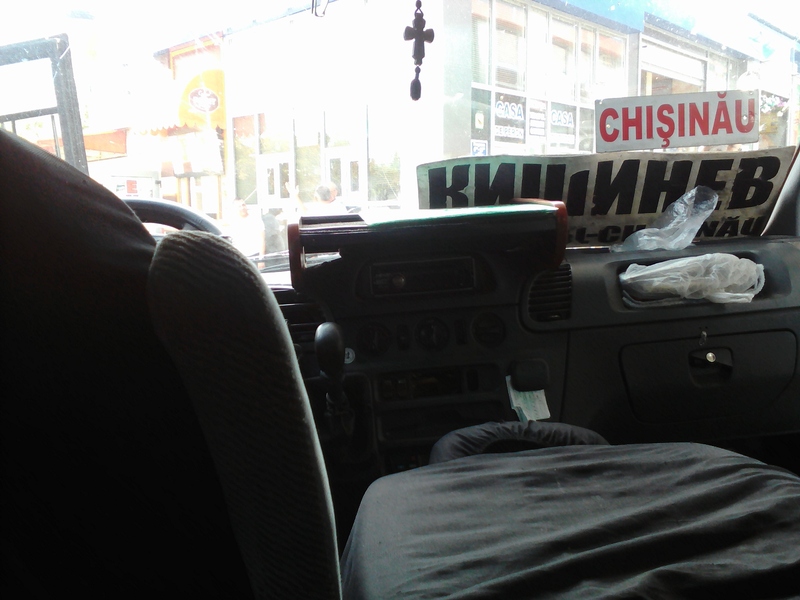 Have you ever wondered what transportation is like in Moldova? As I approach the “finish line” of my Peace Corps service, I finally got some photos (albeit grainy cell phone photos) of the primary form of transportation in Moldova and especially for Peace Corps volunteers: the rutiera. I’ve probably mentioned rutieras once or twice before, since they are the transportation, besides walking, that I use the most. Rutieras are “mini-buses” more commonly known in the United States as commercial sized vans. Most of them are Sprinter or Mercedes vans, which are then customized and outfitted per the drivers’ or owners’ preferences. 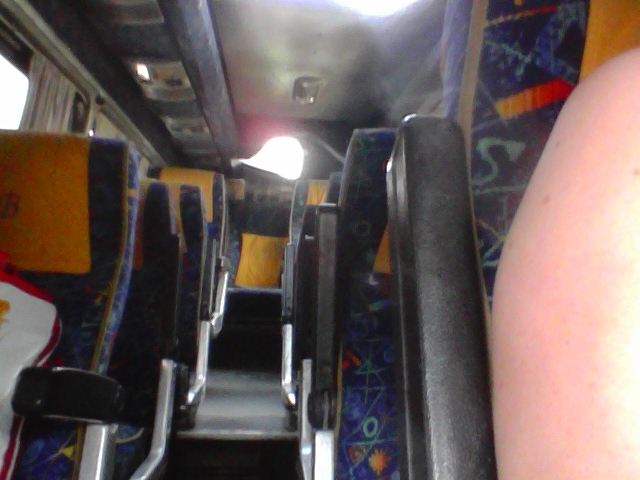 While there are some fancy ones (one time I even got on one that had brand new leather seats, air conditioning!, and seat belts at every seat) most are well-used and not necessarily comfortable. Most rutieras have about 20 narrow seats packed pretty closely together, plus there’s extra standing room in the aisle. While they’re meant to hold around 20 individuals, I’ve been on ones with 30-40 people. In the middle of the summer. Without air conditioning. With the vents closed (Moldovans believe the “current”, or any moving air circulation, will make you sick). Let’s just say those situations are highly uncomfortable, sticky, and hot. While not necessarily comfortable, especially in the summer or when they’re very comfortable, they do have some positive attributes. Nearly every village in the entire country is connected to the capital with at the very least one trip there and back each day, though most villages and all larger towns have multiple trips per day. It’s also typical for there to be a rutiera trip to and from the raion (district) center each day. The rutieras usually are very regular and have specific departure times, plus you can wave them down along the route (you don’t have to board at the first stop in most cases). They’re also fairly reasonably priced, especially in comparison to American public transportation. Taking a rutiera in the capital to any other place within the city is only 3 lei or $0.18 USD. The rutiera from my village to the capital, 100 km away costs 47 lei or $2.79 for about a 2-hour one-way trip. A fairly typical interior, facing towards the back, in an older rutiera- on the right side there are usually two seats side-by-side, and on the left there is usually one seat. The aisle is narrow but can fit a surprising number of people crowded together, and the last row consists of four tightly-packed seats. My village has two rutieras that go directly to the capital each day. One leaves my village at 5:40 in the morning and leaves Chisinau (the capital) to return to the village at 1:40 in the afternoon. The other leaves my village at 5:50 in the morning and departs Chisinau at 2:50 in the afternoon. While not ideal as every trip to the capital means getting up by 5:00 in the morning and then a 4-hour round trip, I’m lucky that there are almost always seats available. Because my village’s rutiera routes are limited, I’ve gotten to know most of the drivers. When I returned home from the USA at Christmas, my host family was able to call the driver and tell him to be sure to pick me up at the airport (since it’s along our route) to bring me back to the village. While I’m not sure I can honestly say I will miss travelling via rutiera, I will miss having the option of public transportation. It’s something the United States, outside of large cities, is lacking. And I do enjoy the naps that are really the only way to survive long rutiera rides!